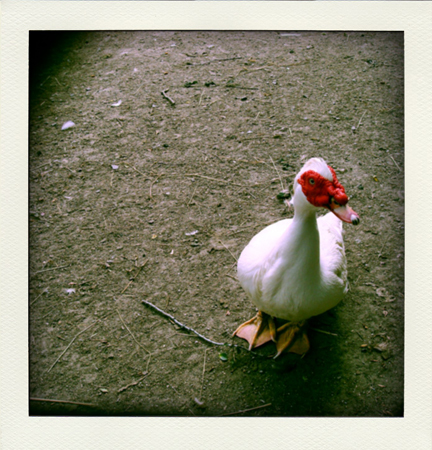 But first, here’s a duck. Kind of an interesting‐looking duck. 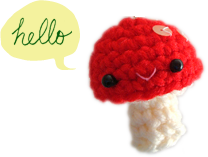 He looks pretty pleasant in the picture, but he (or she?) was actually hissing at all the people in front of him at the moment. 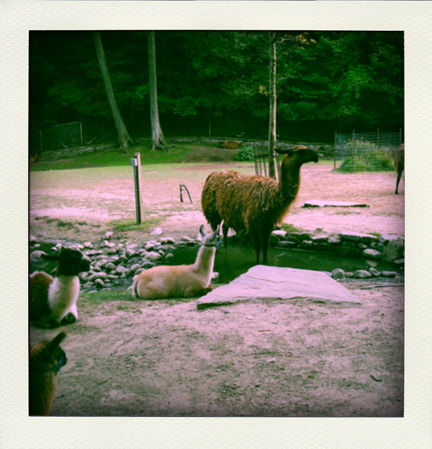 I was really looking forward to seeing the llamas. They’re one of my favourite animals. I once saw a girl holding a llama plush but I was too shy to ask her where she got it from. I later searched online and I think it’s one of the Webkinz. Anyway, I digress. 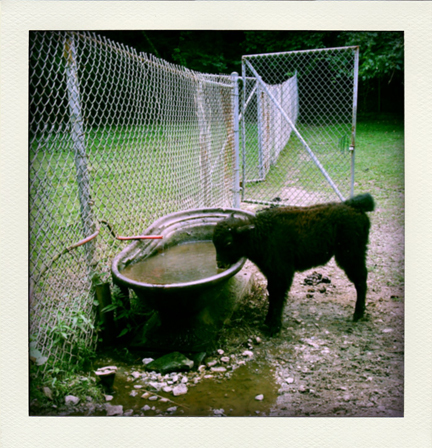 Here’s a llama standing in the pond, cooling off, I guess. 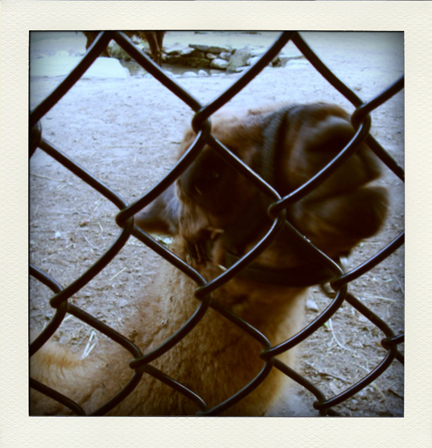 There was a friendly young llama coming close to the fence. Then we saw a large, majestic bison. 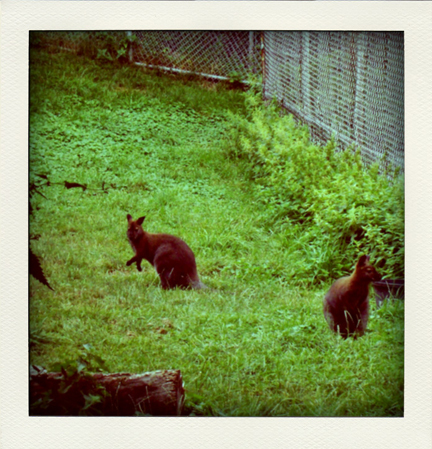 Some wallabies. They look like rabbits from far away. 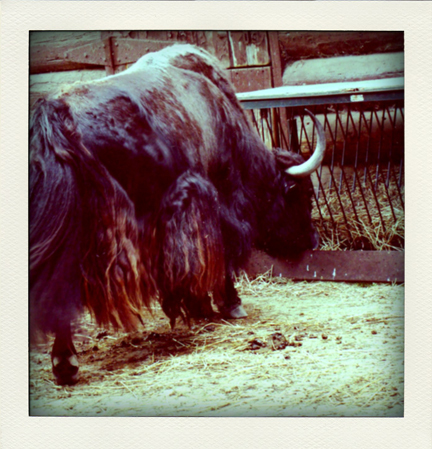 A yak, eating and swinging its long furry tail. A turkey, its tail all fanned out like a peacock. 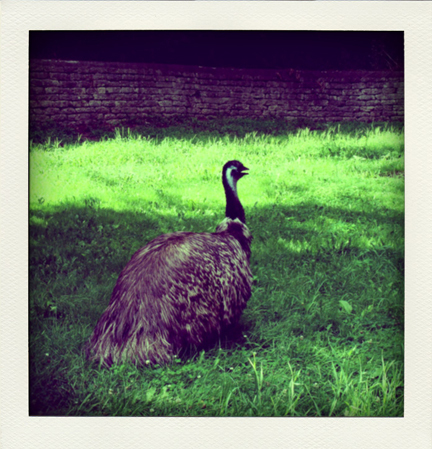 And in a nearby space, an emu, chilling in the shade. Can’t see it in this picture but it looked like it had a silly grin on its face. 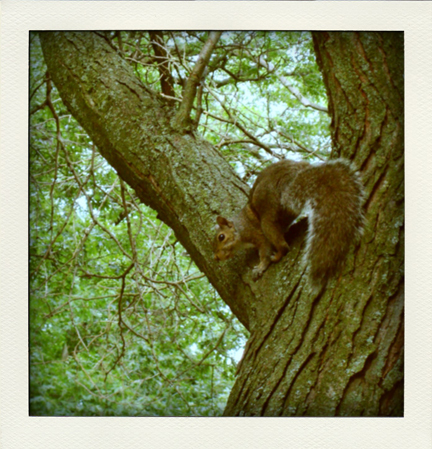 And finally, an animal that’s freely roaming in the zoo — a ninja squirrel. Not a white squirrel, but it has a white belly. 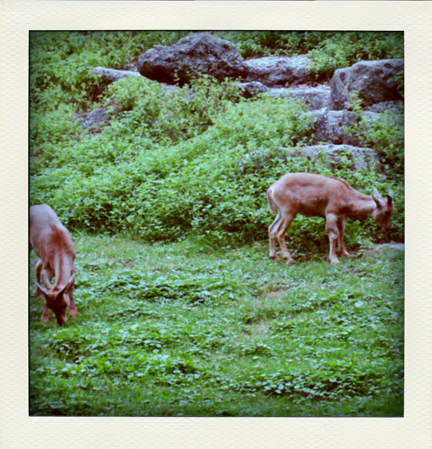 I like visiting zoos. But when I saw kids banging on the fence and tried to scare the animals and I thought, where does that come from!? What did the animals do to you? What if there isn’t a fence and you’re in the wild? Would you want to be yelling and threatening the animals then? But I thought it wasn’t my place to say anything. 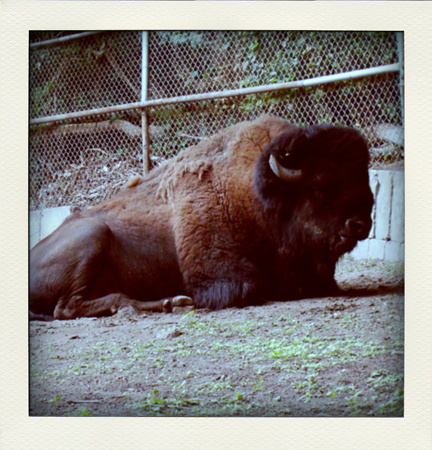 Indeed, when I was standing in front of the bison I realized that there was merely a 30 feet distance and a wire fence between me and the bison. What would happen if the fence isn’t there? Would I ever be able to see this animal outside of a book or web page without this fence? I’m a bit of a scaredy cat so I wouldn’t really go near a large, free‐roaming animal, not even a large dog. But is it worth it for the animal to sacrifice its lifetime of freedom just so that humans can go see it? I heard that animals often live longer in captivity, having a stable supply of food, being taken care of if sick, and without their natural predators around. But I wonder if they’d prefer a long, sedentary life, or a relatively shorter life with all the dangers but also freedom and different things to see and experience. Does it make a difference to them? Part of me thinks it’s sad that the animals are caged. 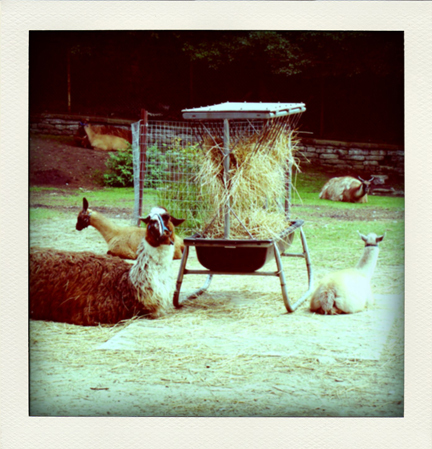 But when I saw that the llamas and mouflon sheep just kept chewing their food calmly and stared back blankly at the kids who were trying to scare them, part of me laughed and thought, the animals might be thinking that we humans are caged and look at how entertainingly silly they are! I still don’t have answers to these questions, and I still like to go to the zoo, because I think animals are so beautiful and fascinating. I imagine that when I meet my Maker in Heaven one day I’ll be able to befriend these animals, without fences and fears. 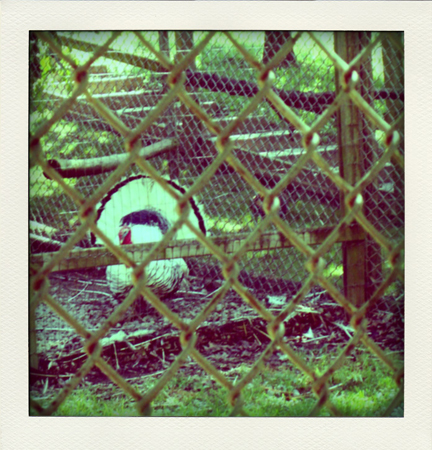 Cute post :) I too have wondered some of these thoughts about zoos. I tend to think that most of the animals in the zoo have been bred and born there and they don’t really know anything else. If they were released into the wild they probably wouldn’t last long. Sort of sad to think about. that’s true, animals are often bred for the zoos, i suppose. so they don’t really know what they’re missing.